I went back to my alma mater, Blair Academy, for my 25th reunion. I wrestled at the school starting in 1981, which they have had a run on being national champions in prep schools for 30 years. Blair is widely regarded as the best high school wrestling team in the country, for which I had little to deal with. The Assistant coach during my last years, Jeff Buxton, is still there leading the team...truly amazing accomplishments. Coaches Hutchinson and Latessa have since moved on, but they were also amazing at building the program in its early stages. Adam Frey ’05 and Ryan McGrath ’98 were accomplished wrestlers at Blair who died from cancer at young ages. Cage Fighter created a fundraiser Tshirt, which proceeds from the sale of the shirt go towards the Foundation in Memory of Adam Frey and Ryan McGrath. "The Adam Frey Foundation is a non-profit organization formed by Adam Frey to give comfort to and provide enjoyment for those receiving treatment for cancer. During an aggressive bout of chemo, about a month before Adam passed away, he wrote in his blog, “Hopefully life outside of chemo and the sickness will be comfortable.” The purpose of The Adam Frey Foundation is to make this hope come true for people fighting cancer. When Adam was undergoing cancer treatments, he would visit with the other patients in the hospital. It did not matter to him if someone was nine or 90; he was going to engage them in conversation, and it was these conversations that enabled him to see a real need. He started with bringing a hot lunch every third Wednesday to the Hillman Treatment Center in Pittsburgh. Then when Adam started going to Sloan Kettering in New York for treatments, he asked, “Mom, can you make dinner for the whole floor. Mom, when you order the groceries, get this type of Gatorade for this person and this cookie for that person.” He even planned a turkey dinner one day and invited people as he walked down the hall. Adam had the means to help, and he did, no matter what he had to do. It was at this time that he decided that when he left New York, he was going to start a foundation that would help people get the food they needed, gas monies to get back and forth from the doctor’s, air fare, and other necessities needed for life with cancer. His mindset is that millions of dollars are allocated to the research of cancer, but very little goes into funds that can be used for something other than needles and pins; something that can put a smile on their face. As of today, The Adam Frey Foundation is the leading contributor to the Hillman patient assistant program where gifts cards are provided in $100 amounts to be used for food, gas, or prescriptions. We have also organized an event for Easter where the Easter Bunny will be providing treats to the children, and gift cards to the parents at the Children’s Hospital Cancer Ward in Pittsburgh. Also, we are in the process of speaking with The Hope Lodge, and Sloan Kettering, both in New York City. As The Foundation grows, the amount of those who we can help will also grow. Adam was very passionate about this work, and it is through this Foundation that not only his love of life and compassion for people can continue to spread, but his fighting spirit will also live on." 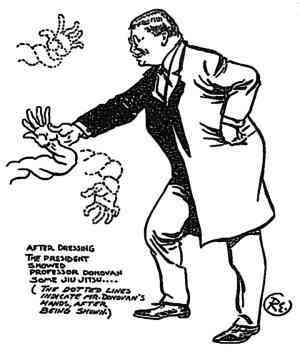 According to an article on aikidojournal.com, President Theodore Roosevelt trained jiu jitsu to lose 20 pounds prior to an election. He also aspired to attain the fifth degree of the seven degrees (purple belt?). Below is an extract from Professor Yamashita Goes to Washington. Although The World reported that there were seven degrees in jiu-jitsu, and Roosevelt intended to have at least five of them, Roosevelt’s primary goal in all this was not rank, but weight reduction. Since becoming President, his weight had soared to over 220 pounds, and he hoped to be down to 200 by the elections. So, during March and April 1904, Roosevelt practiced judo three afternoons a week, using a ground floor office in the White House as his workout space. Then, for the rest of the summer, he practiced occasionally. He stopped training during the elections, and there is no record showing that he resumed his studies afterward. Links about the history of Brazilian Jiu Jitsu. This post is updated as I come across new information. Review of book, Carlos Gracie: The Creator of a Dynasty, published in Brazil. Jiu Jitsu for Kids is Professor Carlos Rollyson (7th Degree Black Belt in Brazilian Jiu-Jitsu) in a cartoon with sparing teddy bears and teaching the ippon seoi nage to an alien. The move is shown in 4 angles and is actually sort of technical, you could say. At first, you are not sure what you are watching: a SNL-like parody skit about BJJ or a genuine kids cartoon. Its amusing...for a few minutes. Very creative and well done. Are you a fat, out-of-shape, couch potato? Good. Stay that way. Or... Take up Brazilian Jiu Jitsu and replace that description with "In pain, writhing, moaning on the couch." 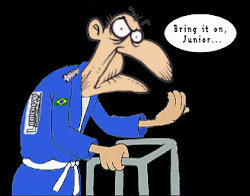 This is a blog/compilation of BJJ information and experiences of a 43 year old attempting to learn Brazilian Jiu Jitsu. 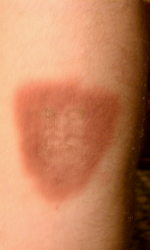 Brazilian Jiu Jitsu (BJJ) is a great sport. It is also very difficult for those suffering from the post-tonal swelling of midlife.